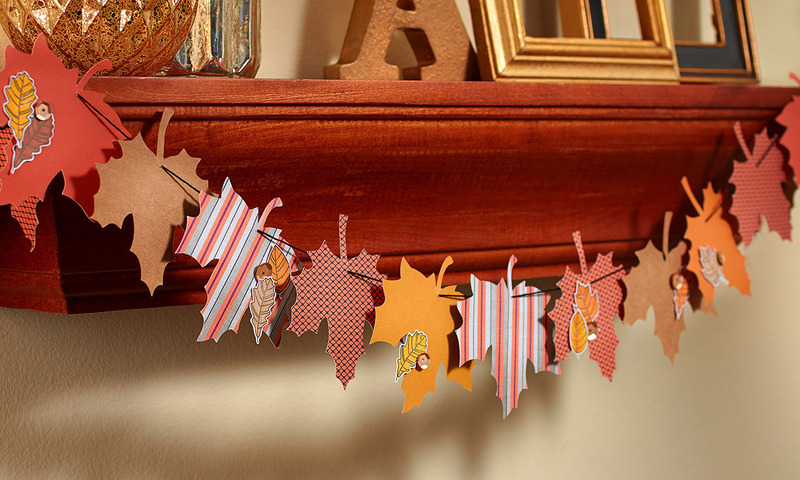 This fun, festive banner comes together quickly and easily with a little help from our Cricut® Artbooking and Artistry collections and, of course, the Nevermore paper packet. What a great project to do with young children or grandchildren. They would love to watch the Cricut® cut out the leaves (because it’s even exciting for us adults to watch! ), and then they could help slide the leaves onto the thread. If you don’t have any small children around, this would also be a relaxing project to work on while enjoying a little “me” time watching your favorite Julia Roberts movie and sipping some warm apple cider. And did you notice the stamped leaves our artist colored in with the ShinHan™ Touch Twin™ markers? With the help of last week’s post about using these markers with our stamps, you could easily do this at home. The My Acrylix® Thankful Heart stamp set supplied the leaf images, which add such character to the banner. You could even add different stamps or embellishments to match other elements of your home décor. There are so many works of art you can create with the Nevermore paper packet. Share you own Nevermore artwork by using the hashtag #ctmhnevermore, or search for this hashtag on Facebook, Instagram, and Pinterest for more artwork inspiration from the Close To My Heart community. I would like to see ctmh offer the workshop on the go brochures for individual purchase. Many times I buy the workshops but sometimes I buy the paper pack separate and would still like the cutting instructional guide for the pattern. I would be willing to pay for the guide if offered separately, I have other gals that have stated the same. Hi I am wondering if the black string used is a CTMH item? Thanks. this banner is adorable! I love Fall so much!